Our clipboards and a few of our picture frames will be making their debut in a few weeks in the brand new, ssShiney Baubles boutique, in Blue Ridge, Georgia in the Blue Ridge Mountains! We are excited to continue to expand! This store will have lots of our fun custom clipboards with bright new colors and designs! We have a few online stores that will soon be carrying Blessings and Bows products, too! They will be posted as they add our products to their website! This one's for all of you avid professional photographers or complete amateurs, like myself. A "funky camera strap" from emfalconbridge's Etsy store will have you taking photos in style!! Each strap is covered in fun and funky ribbons! The store owner says, "now, I bring to you some of my favorite ribbons from Thailand as well as other exotic, funky and good ol fashioned fun designs to bring your camera to life and make it more 'YOU'!" Visit emfalconbridge's online store to view all of the fun and fab styles! Using this, the results are now in! The winner is Audrey! Congratulations, Audrey! Email me at aubrey@blessingsandbows.com for info on ordering your FREE custom clipboard and pen set! Thank you to everyone who participated! I hope to have additional giveaways in the future! For those of you who linked me, don't forget about your 20% discount, now through March 31st. Be sure to check out my Blessings and Bows blog weekly for contests, discounts, and featured artists/crafters who use ribbon in their designs! Blessings and Bows ONE YEAR ANNIVERSARY & GIVEAWAY!! In honor of Blessings and Bows' ONE YEAR ANNIVERSARY, I am conducting a special and a giveaway for YOU! Winner will receive a custom hand-painted clipboard of his/her choice AND a matching pen (one of our new products)! Samples of each are pictured above. All entrants who add my website and blog to their blog links will receive 15% off their entire Blessings and Bows purchase now through March 31st! 1.Check out my BLESSINGS AND BOWS site. 2. Visit this blog and leave a comment telling me which products are your favorite! You can only enter once. 3. Blog about my Blessings and Bows giveaway, linking your friends to this blog. 4. After you link me up on your blog post, leave me another comment, telling me that you set up a blog post about the giveaway. That will enable you to be entered twice!! DEADLINE TO ENTER is Saturday, March 22nd at 10am CST. Winner will be announced by Saturday afternoon. I would like to give a huge THANK YOU to all of my friends, family and people I've never met who have supported my Blessings and Bows business this past year! I can't believe it has been a year already!! This has been such a fun adventure! What started out as a plan to make custom gifts for friends' baby showers has turned into a fun business and creative outlet! Thank you to my sweet husband for working with me this past year to develop my logo, website, print media and just overall "branding". He has also been such a huge support daily! Every time I bring a freshly painted frame or clipboard or whatever into the office to show him, instead of just nodding and saying "uh, huh, that's great..." he always gives such positive and constructive feedback! He never acts tired of looking at my products or acts bored with the whole thing. He has just been wonderful! Thank you Josh for everything and for not getting frustrated when I stay up until 3am working on orders! Thank you to everyone who has supported my business in any way! I look forward to year number 2!!! Be looking for a few new product lines coming your way soon!!! Our Strawberry Limeade Clipboard is now featured in a great online boutique, Preppy Monogrammed Gifts! They sell all things monogrammed! Check out their great selection and variety of gift items! We are excited to be expanding our Blessings and Bows products into other online boutiques! This item is a great idea and a solution to those boring Bumbo, yet functional chairs!! These adorable Sweet Cheek seat covers are custom made with so many different fabrics and designs to fit your personal style! I love the use of ribbon to hold toys and more! 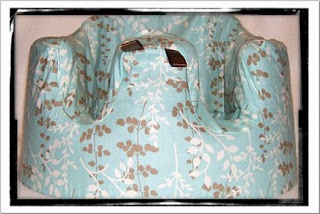 This is a darling and functional product that would make a WONDERFUL baby gift!!! I love the high quality at such a reasonable price! Sweet Cheeks seat covers offer the perfect solution to the non-breathable rubbery material that sticks to your baby’s delicate skin when you sit them in the Bumbo infant chair. 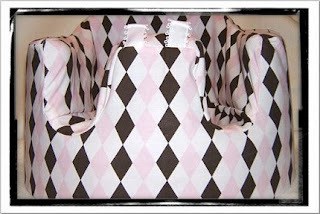 This soft machine washable cotton seat cover is covered in diamonds of brown, pink, and soft pink. Other features include 2 loopy tags for attaching link toys, and an 8 X 5 parent friendly pocket...made to hold pacifiers, teethers, toys....etc. 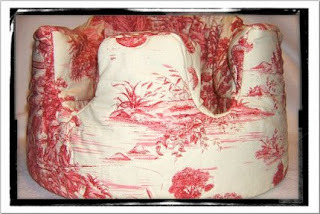 for your handmade one-of-a-kind Bumbo cover!! Mention the Blessings and Bows Blog in a convo to Boutique Sweet Cheeks, before making a purchase, and you will receive a 20% discount! !